1. Your steel frame rail is a very poor conductor of ground current. 2. Ground current is 50% of your electrical system. 3. Over a period of years, the connection between the frame and your ground wire will corrode or rust, interrupting your ground current. 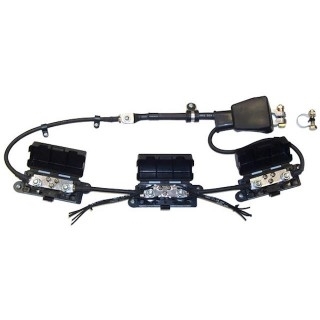 The American Autowire system eliminates the frame rail from the ground current by using three grounding boxes connected by 6 gauge copper cables. This kit includes 20 coils of wire marked every five inches with the required circuit function identification. Terminal lugs and a 6 gauge crimping tool are included.